Defined by its castle, roads paved with chunky limestone and shale, imposing slate-roofed houses and views out to the Drina Valley, Gjirokastra is a magical hillside town. Immerse yourself into the local life, meet with interesting locals and relive the past. Introduction to the most fascinating monuments and heritage sites in the city. We will have the chance to walk the narrow cobble streets of the medieval bazaar and Ottoman-style houses where artisan women will be making doilies as well as carving wood and silver. Following this, we will have the unique experience of visiting the locals in their own homes and being treated to traditional, stone-ground coffee as well as "mountain tea." We will continue our tour in other quarters of Gjirokastra, including a visit to the castle itself. We will then have the chance to taste regional food cooked by locals. To finish off our tour, we will visit the historic Skenduli House that was built in 1700 (most likely being shown around by Mr Skenduli himself) as well as the Ethnographic Museum. 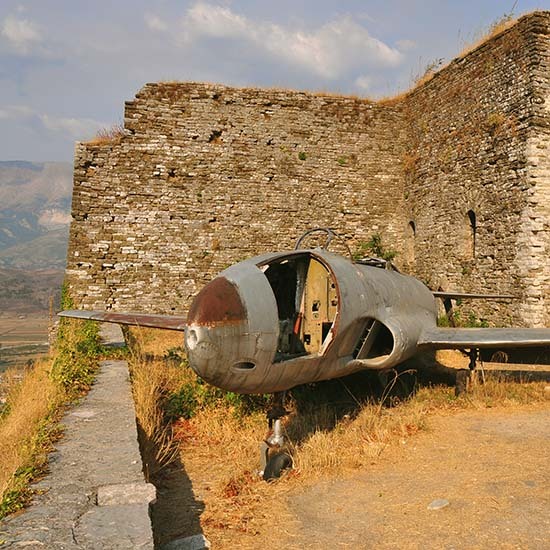 Before completing the tour, you'll have free time to explore the city as you wish, either by relaxing with a coffee and enjoying the view or exploring more of the history that Gjirokastra has to offer.